Trunks: Erect, diameter 1 to 2 feet, branching 6 to 16 feet above ground; branches ascending, dividing numerous times into smaller horizontal branches; bark of young trees smooth, reddish-brown; bark of mature trees dark gray to nearly black, deeply fissured with narrow ridges or long, thin plates; trunk and branches often densely beset with thorns; thorns simple to branched, stout, 1.2 to 8 inches long, reddish-brown, shiny, round in cross-section, base flattened. Twigs: Often zigzag, rigid, shiny, reddish-brown to grayish-brown; nodes somewhat enlarged; leaf scar irregularly heart-shaped; bundle scars 3. Leaves: Alternate, deciduous, pinnately or twice pinnately compound, 6 to 11 inches long; leaflets in 7-16 pairs, elliptic-oblong to lanceolate-oblong or narrowly ovate, .75 to 1.6 inch long, .4 to .5 inch wide; upper surface glabrous, green; lower surface paler, yellowish-green, sparsely short-hairy; margins entire to remotely round-toothed; stalk 1.2 to 2 inches long, grooved, short-hairy, base enlarged; tip rounded; leaflets of twice-pinnate leaves smaller than those of pinnate leaves. Flowers: Appear after leaves in racemes, male and female flowers usually on separate trees; staminate racemes spike-like, 1-7 from spurs, 2-4 inches long, many-flowered; staminate flowers small, numerous, crowded, sessile to short-stalked, yellow pubescent, in 3's, center flower opening first; calyx bell-shaped, 3-5-lobed, green, hairy; petals 3-5, 1/12 inch long, greenish-white, hairy; stamens 3-8; pistillate racemes usually solitary, spike-like, 1.2 to 2 inches long, 8-15-flowered; flowers widely spaced, similar to male flowers. Fruit: September; pods, drooping, straight or curved, twisting with age, flat, 4-14+ inches long, 1 to 1.2 inches wide, purplish-brown; velvety pubescent when young, glabrous when mature; base stalk-like; tip pointed; seeds 6-27, oval, .2 to .4 inch wide, flattened, hard, brown or olive. Habitat: Moist woodlands, stream banks, pastures, roadsides, hillsides, fence rows; prefers deep, rich loam, but found in a variety of soils. Uses: Squirrels eat the seeds and deer and cattle will browse the leaves. Songbirds and morning doves nest in honey locust. Native Americans used the ripe, raw pods for food and made a beverage by soaking the pods in water. The bark was steeped and the liquid taken for colds, fevers, and whooping cough and an infusion of pods taken for measles. The thorns were used as needles and weapons. Comments: Honey locust is often planted in windbreaks because it is fast growing and drought resistant. It can spread aggressively and sometimes becomes weedy. The thorns can be injurious to livestock. Reproduces by seeds and rhizomes. The wood is brownish-red, hard, durable, and is used for fence posts and furniture. The pods have high sugar content and the seeds high protein content. 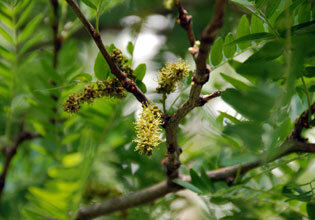 Gleditsia refers to Johann G. Gleditsch, a German botanist who lived from 1714 to 1786.